Virtually no upholstery work can be performed on an old car without the use of hog clips. These wire-based fasteners have been used on the farm for nearly 200 years and were the mainstay of automotive upholstery for decades. Newer vehicles utilize Velcro and other forms of fasteners to hold upholstery in place, but the chances are certain that your efforts to recover your seats will entail removing and replacing hog clips. The first thing to know about removing these fasteners is that they are made of tough, hard wire with pointed tips. 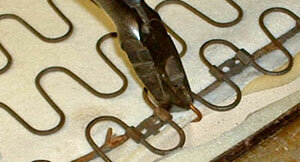 They look easy to bend but they are not, so don't even think about grabbing them with needle-nosed pliers and twisting. The pliers will disintegrate. 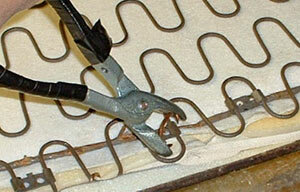 There are two basic ways of removing those tightly-compressed hog clips: electrician's pliers and hog clip cutters. We'll assume you don't have a pair of hog clip cutters since, to be honest, neither do we because we tend to shy away from single-use devices. You do, however, probably own a pair of heavy-duty electrician's pliers and they will work very nicely. Electrician's pliers (sometimes called "side cutters") are great multi-taskers and a necessary addition to the tool box. Anyway, to remove a hog clip just grab the longest part you can access and twist firmly in the counterclockwise direction. In fact, you can twist in either direction but we find it's a little easier to hold firmly and twist counterclockwise rather than the reverse. 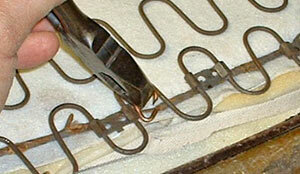 You only need to twist about 90 degrees to get the ends of the clip free, so don't overwork your self. There are many, many other clips to remove and you'll get tired. Grasp firmly onto the clip with the pliers. Twist until one end bends away enough to remove the clip. Putting on new clips is much easier, but you need a hog clip pliers. Nothing in your toolbox works nearly as well as one of these and you can find one right where you buy the clips themselves — hardware stores. They only cost a few dollars. Before you use the pliers make sure you pad the handle ends with tape and whatever material you have handy. We find they are far easier to use when the ends are padded. Otherwise they will dig into your palm and create blisters. Anyway, using them couldn't be simpler. Just insert a clip in the jaws, position the clip over the two items you are fastening together and compress the handles. The clip bends easily and wraps itself around the fastening bar with no fuss. 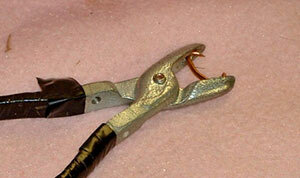 Hog clip pliers loaded with clip. Note padded handle. The clip is wrapped over the two items it's connecting, squeeze, and viola!